Sun Lakes Arizona Market Report for January – June 2014 as compared to same time last year is alive and well with just 127 homes actively listed for sale as of today. That represents just over 1% of the overall market of just less than 10,000 homes. Low inventory is driving the index toward more of a seller’s market which is a turn of events from earlier in the year when buyer demand was very weak and inventory much stronger. 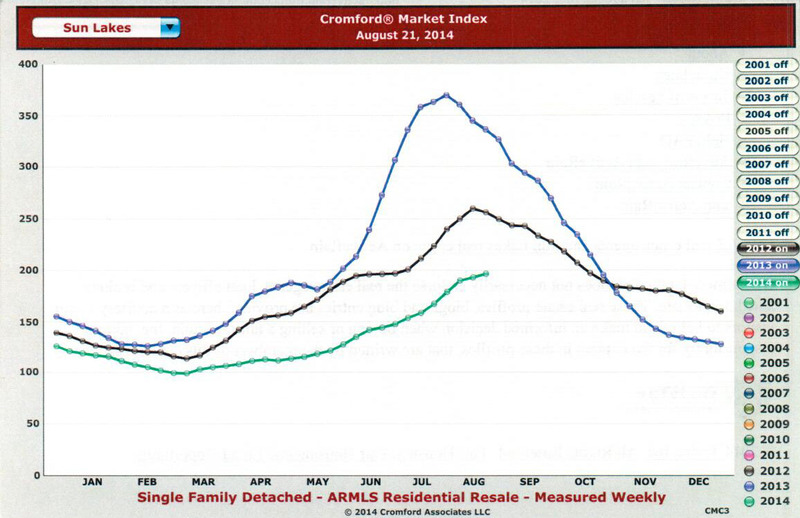 The Cromford Index is a resource we use to measure and track real estate trends. The index at 100 represents a neutral market – neither buyer or seller market but more of a balanced real estate market. Notice in 2013 the index rose to 369 – the highest in over 10 years and representing a hot seller’s market that is unusual for the hot summer month of August. 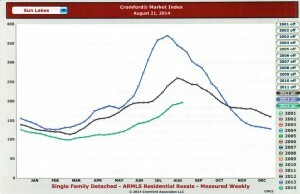 Low inventory and high buyer demand drove that index. Note that it began to fall shortly afterwards and fell to a low of 99 (neutral with low buyer demand representing a buyer’s market) in March 2014. It has slowly risen to its high this year so far at 196. With just 32 homes for sale Oakwood has seen a 15% increase in value over same time in 2013. During the first half of the year of 2014 Oakwood had 103 homes sold with an average price sold of $326,629. Average square footage of homes sold was 2,187 with an average price per sq ft sold of $151.01 and 69 days on market. Compare that to 2013 when 106 homes sold at an average price of $283,035. Average square foot of homes sold was 2,034 and price per sq ft sold was $139.00. Days on market were 78. Ironwood has just 8 homes actively for sale today and has seen just over a 13% increase in value over 2013. In 2014, 23 homes have sold for an average price of $316,408 and average sq footage of 2,231. Average sold price per sq ft was $140,63 and 81 days on market. Compare to 2013 when 37 homes were sold with an average sold price of $279,198, average square footage of 2,205 and average price per sq ft sold was $126.31 with 104 days on market. Palo Verde has 14 homes currently for sale and has seen a more modest 10% increase in value in 2014 with 40 homes sold at an average price of $273,270. Average square footage was 1,948 and sold price per sq ft was $140.44 with 68 days on market. 2013 had 34 homes sold with an average price of $247,912, average square footage of 1,958, average price per sq ft sold of $127.74 and 98 days on market. Cottonwood also had just over a 10% increase in value in 2014. Currently 41 single family and villas are actively for sale. 2014 has had 95 homes sold with an average price of $200,555, average sq footage of 1,717, average price per sq ft sold of $118.22 and days on market at 50. Compare to 2013 when 119 homes sold at an average price of $181,298, average sq footage of 1,735, average price per sq ft sold of $105.29 and 76 days on market. 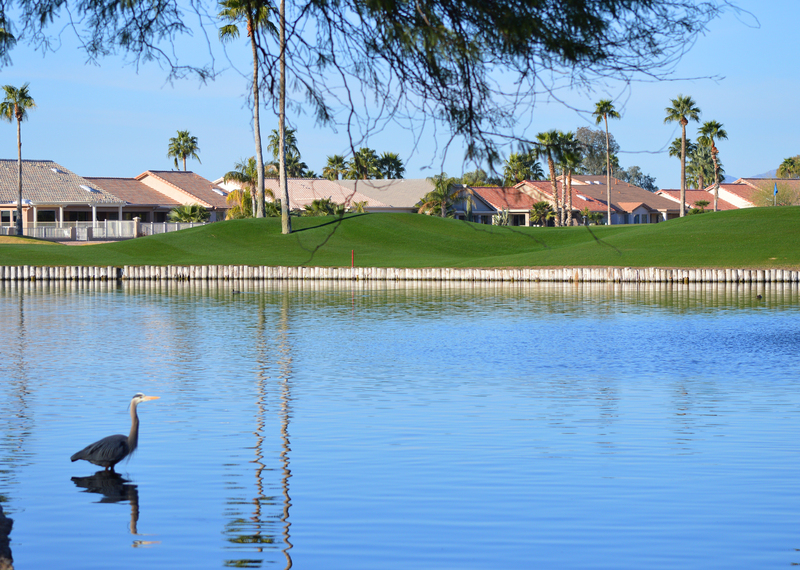 Sun Lakes Country Club has the smallest growth over 2013 at 6.5%. Currently 32 single family and manufactured homes are actively for sale. 2014 sales for the first half of the year was 31 with an average price sold of $154,002, average sq footage of 1,430, average price per sq ft sold of $110.07 and 76 days on market. Compare to 2013 when 40 homes sold at an average price of $144,504, average sq footage of 1,552, average price per sq ft sold was $95.25 and days on market were 89. Good news for homeowners who are happy to see values rising. It remains to be seen what the 2014 and 2015 season will be but we are expecting buyer demand to increase with the calls and inquiries we are receiving. All of us on the Kolb Team live in Sun Lakes full time and we specialize in real estate here. Give us a call with any specific questions you have about the market or home prices. You can use this website to search for homes and view community and listing videos. We look forward to talking with you and helping you with your real estate questions and needs.